DC Moore is pleased to present the exhibition Robert Kushner: Silk Road, showcasing the artist’s most recent paintings of boldly colored, exuberant flowers on grid-like grounds. Paintings such as Many Anemones, Two Red Parrots, and Flaming Purissima combine pattern, surface texture, and surprising color juxtapositions to breathtaking effect. The combination of riotous floral elements with the structure of the grid results in work that is simultaneously geometric and biomorphic, representational and abstract, organic and synthetic. The Uzbeck suzani, Kushner’s unique use of gold, silver, and patinated copper leaf, as well as mica, amplifies the dynamic, unapologetic opulence of his paintings. Seen together as an installation, the paintings in Silk Road encourage the viewer to search for related harmonies or discontinuity within the works as a whole. A color catalogue accompanies the exhibition with an essay by Justin Spring. 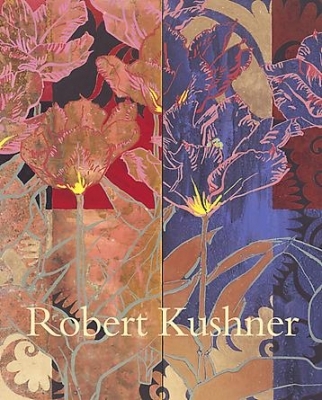 In 2006 Pomegranate published Michael Duncan’s 120-page monograph on Kushner’s recent work. His earlier work receives extensive treatment in Gardens of Earthly Delight, written by Alexandra Anderson-Spivy and Holland Cotter and published by Hudson Hills Press in 1997.